Rebibo, Janice. 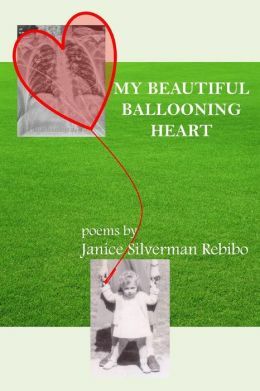 “My Beautiful Ballooning Heart: Poems by Janice Silverman Rebibo”, Coolidge Corner Publishing, 2013. This past week I had the opportunity to meet a fantastic poet and to hear her read. I was totally unfamiliar with her and her poetry and as she spoke I realized that indeed I did know of her indirectly as I was extremely familiar with the Israeli poets that either she or the moderator of the afternoon mentioned. Israel, for a young nation, has a wonderful poetry heritage—Chaim Nachman Bialik, Leah Goldberg, Rachel, Alexander Penn, Nathan Alterman, Chaim Guri, Natan Yonatan and Janice Rebibo (to name a few). Rebibo, an American, wrote her first poetry in Hebrew, which, in itself, is quite a feat when we consider that Hebrew is not her mother tongue. She read in both English and Hebrew and listening to her, I was amazed at her Hebrew vocabulary and how much she is in the Israeli tradition of writing poems that are personal and reflect the love of the country. For the short period that I heard her read, I felt as if I was fact in the land sharing my home with the other great poets who lived where I did. But even more interesting was hearing Rebibo cross international borders as she wrote of love and trauma. Her poems are also reflections of who she is and she pulls us into her life and shares it with us. She began by reading seven short poems that are personal and really set the stage for her poem about the assassination of Yitzhak Rabin, former prime minister of Israel. She chose to read it since this year is also the anniversary of the assassination of our president, John Fitzgerald Kennedy. Rebibo also uses wit and humor in her poems and especially so in her “Four Poems for Old Lovers” and it is through them (and through others) that we really meet the poet; learn of her past and her present and watch them come together. Her poems are about the reality of life and I felt that as she shared her memories with us that they touched my own memories. Rebibo ended her reading with the poem that also closes this book, “Kissing” which she dedicated to Jacques Derrida, one of my literary heroes but then he is also the hero of many who love language and the deconstruction of literature. She writes of Derrida speaking about language and it is easy to see the influence he has had on her. That is how I felt that afternoon as Rebibo read—there were two—she was one and I was two and everyone else disappeared as I imagined her reading her poetry just to me. She will read just to me now because she honored me with a copy of this book and we can now spend time together whenever I want. This entry was posted in Judaica on February 11, 2014 by Amos.